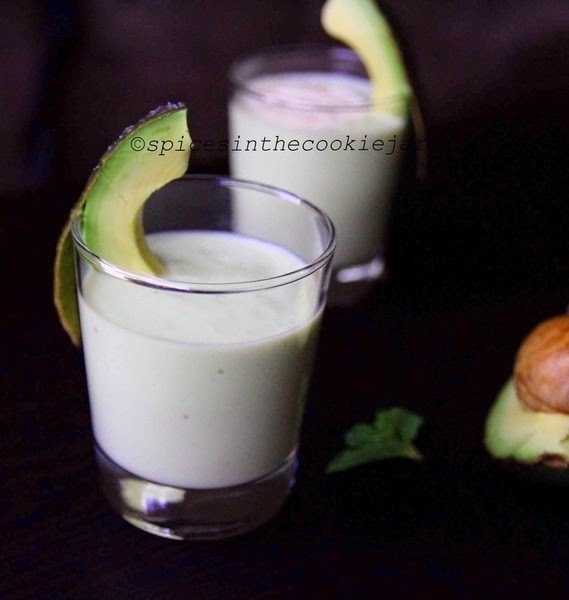 For the rest of the recipe please hop over to Lubna's beautiful space here. We all have our list of go to recipes that we pull out when impromptu guests come knocking on our doors or revisiting some fond memories or planning a lazy Sunday meal or just because it makes you happy and its simple and easy to create yet tastes fantastic. Whatever the reason, these recipes get made quite often in your kitchen. 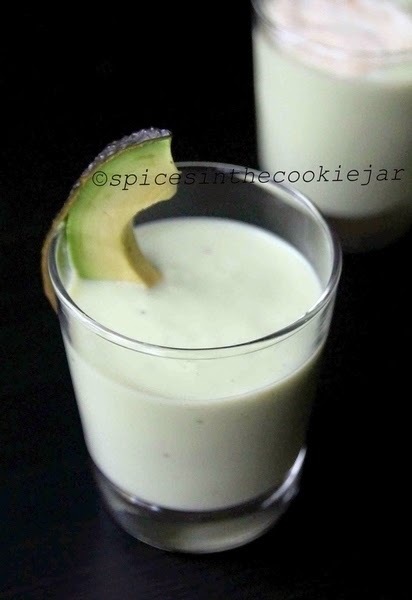 The recipe I am sharing today ticks all the reasons mentioned above for me. 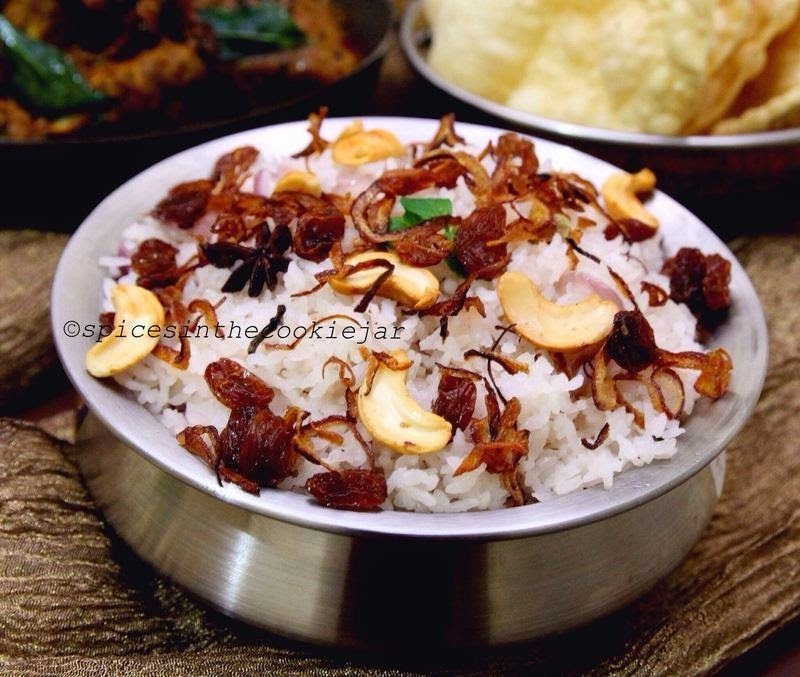 I remember while growing up my vellumma (my maternal grandmother) making ghee rice for Sunday lunches or when we had unannounced guests and it was always paired with a non-veg curry or fry, pappadam, raita, and parippu curry. Every time I make it the irresistible aroma transports me back to her kitchen. 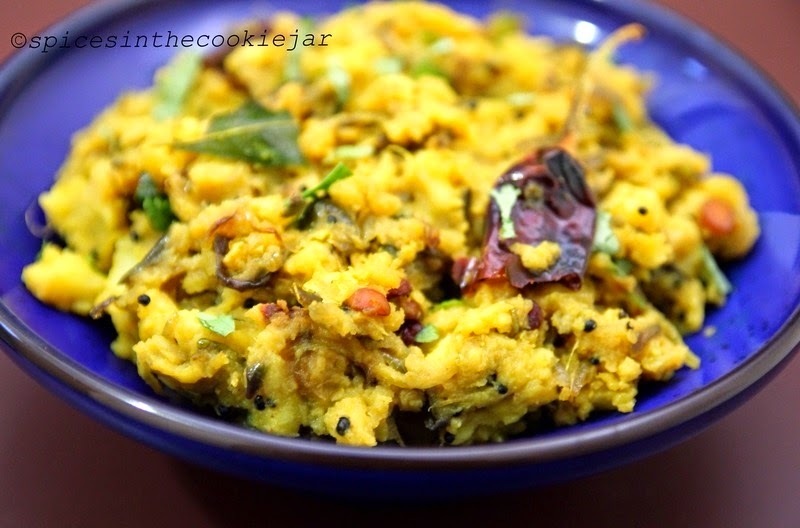 I don’t get to indulge in her cooking as often as I like to these days since she’s back home in Kerala but I do try to recreate the dish she so loving used to make for us. 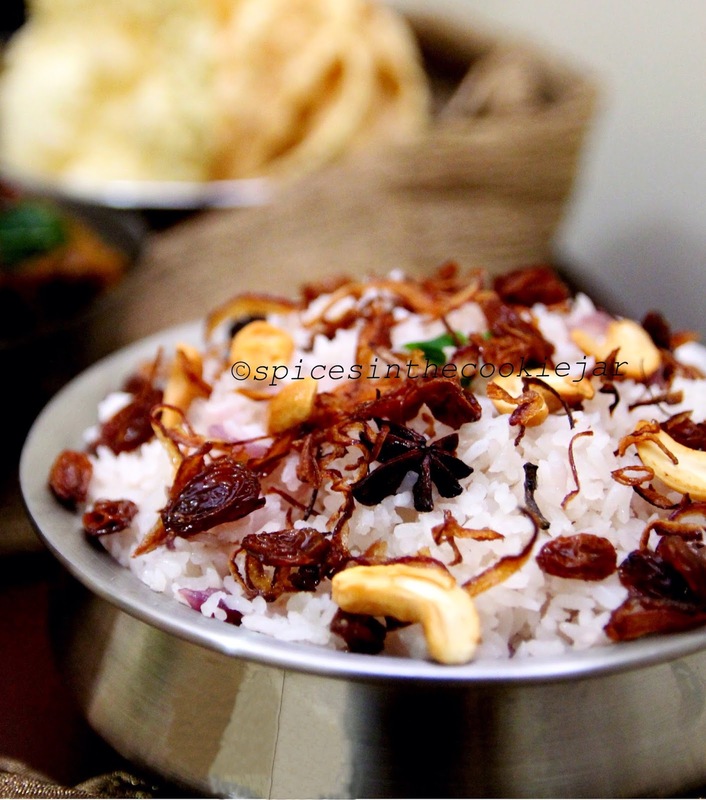 Ghee rice is quite easy to make and you will fall in love with the delicate earthy flavours of rice combined with a distinct taste of ghee and whole spices and a hint of sweetness from caramelized onion. This to me is the ultimate comfort food!! :) So, what's your idea of comfort food? Wash and soak the rice for 10 minutes, drain and keep aside. Lightly crush cardamom and cloves in a mortar and pestle. Heat 4 cups of water separately to boiling point (easier to do this in a kettle). 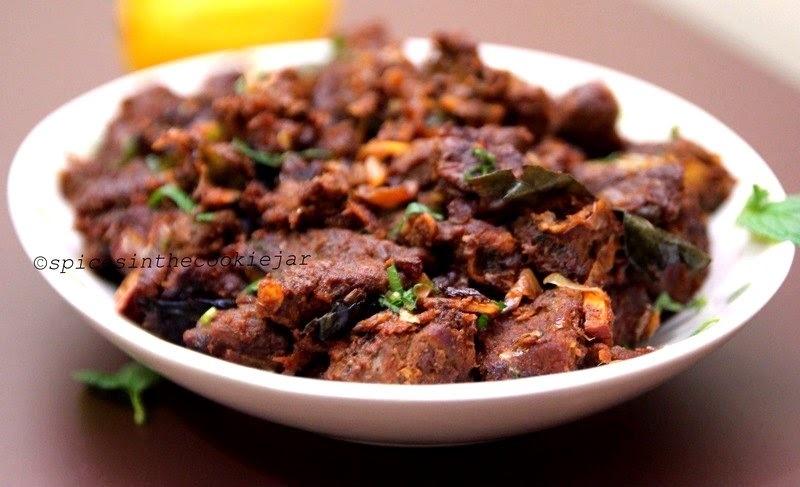 Heat ghee in a wide deep bottom pot and fry the cashews, raisins and extra thinly sliced onions separately till golden brown. Remove and spread on a paper towel. 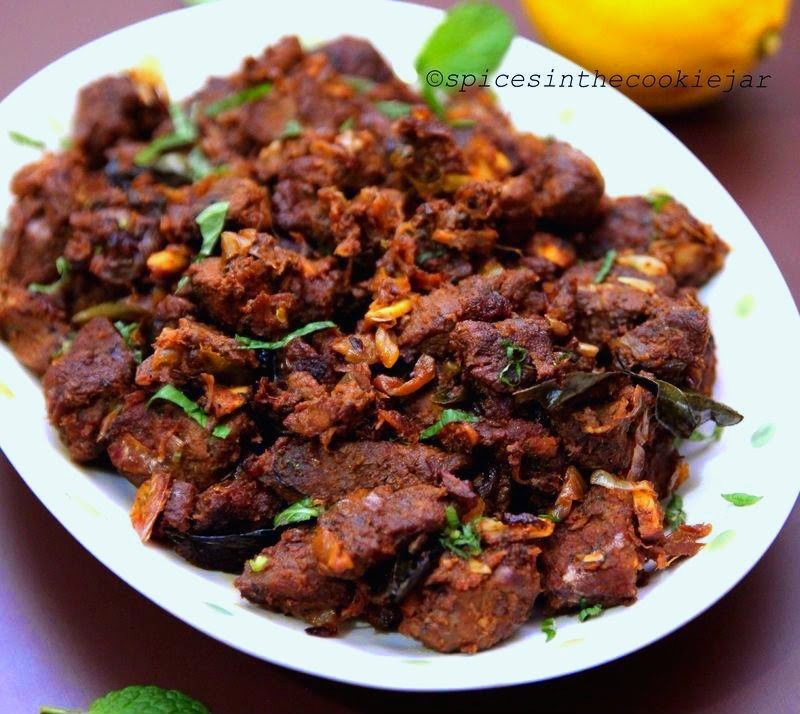 In the remaining oil fry the crushed spices along with the remaining whole spices and a pinch of garam masala for a minute. Add sliced onion and fry till it turns translucent. Add the drained rice and fry for 2 to 3 minutes, stirring continuously. Pour 3.5 cups of hot water along with salt and give it a good stir (check and adjust salt). Bring to boil on high flame, then cover and cook on low flame for 10 minutes (give the mixture a stir after 5 minutes). After 10 minutes when there is no water visible at the top, open the lid and fluff the rice using a fork. 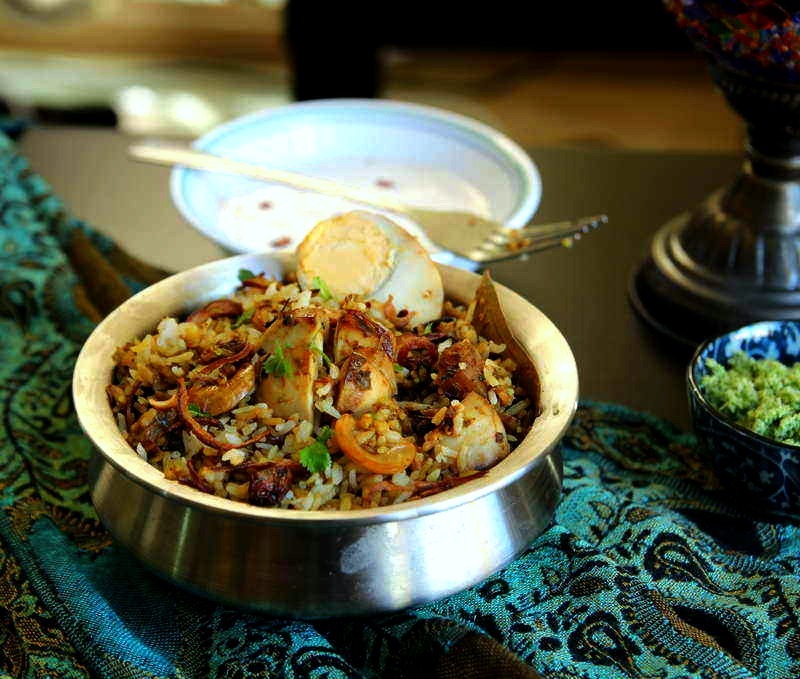 Take off flame, if the rice is not cooked keep the lid back on and let it rest for another 5 to 10 minutes. This will also help to absorb any excess water left at the bottom. 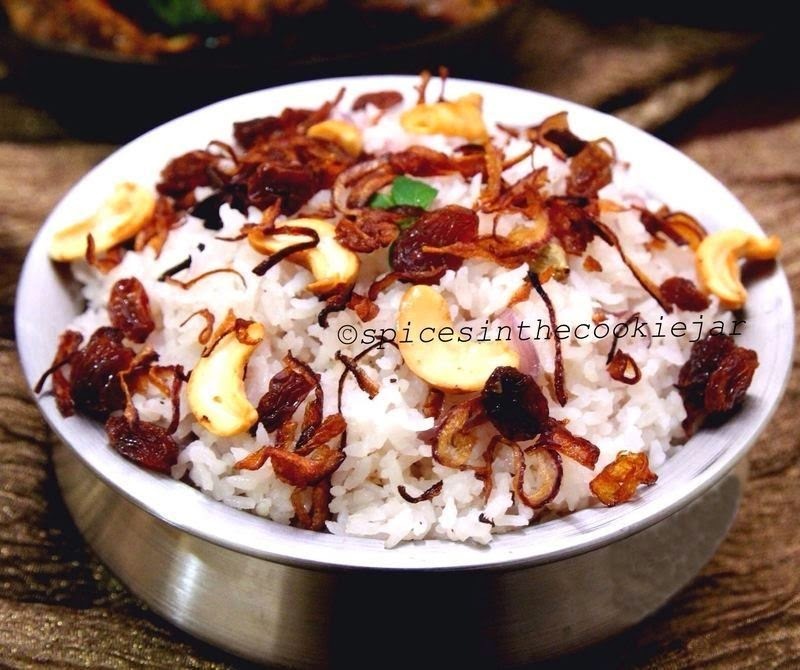 Fluff the rice before serving and garnish with fried onion, cashews, raisins and a sprinkle of garam masala. 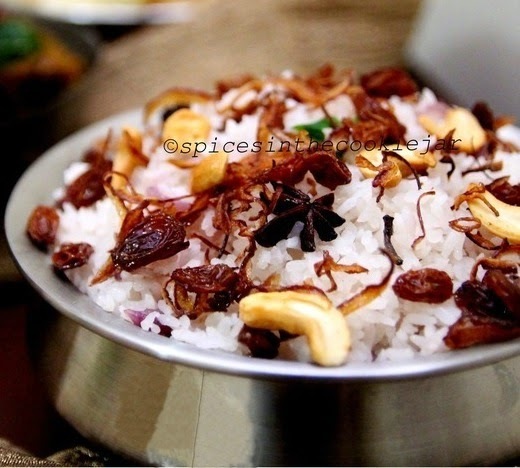 If you want the rice to be separate and non sticky, add 3.5 cup water first and add more boiling water, if required. If the rice is cooked to your liking then fluff the rice and separate half to another bowl so the rice doesn't cook further in the steam. Always use a wide pot to cook the rice so it doesn't get too sticky. You can also use chopped fresh mint and coriander leaves for garnish. Use a tsp of lemon juice along with boiled water to prevent rice from getting sticky. 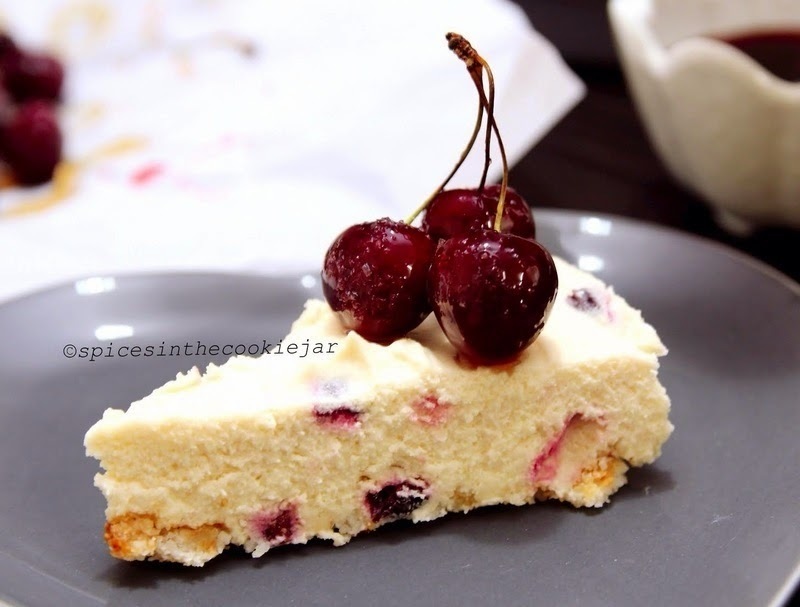 So, let's begin this new year with some cherry cheesecake and wishing all my readers a fabulous 2015 ahead, lets move on to the recipe. Heat a pan and melt the sugar along with the other ingredients under candied cherry except the cherries. 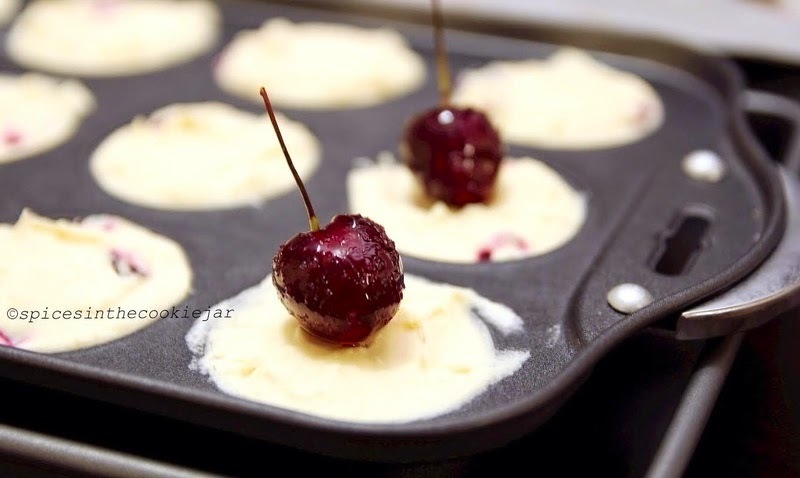 Allow the syrup to thicken a bit before adding the pitted cherries, once coated set the cherries aside. Reserve the remaining syrup to use as a topping sauce while serving the cheese cake. Lightly grease a cheese cake/muffin tray with removable bases and flatten the macaroons to the base of each muffin hole using your fingers. In a small heatproof bowl combine gelatin and 2 tbsp water. Let it stand in a bowl of simmering water until the gelatin dissolves. Meanwhile, melt chocolate in a bowl over simmering water, stirring until smooth. Stir the gelatin mixture into the melted chocolate until combined. Set aside. In another bowl beat cream cheese, sugar and vanilla until smooth and creamy.Add chocolate mixture and beat until combined. 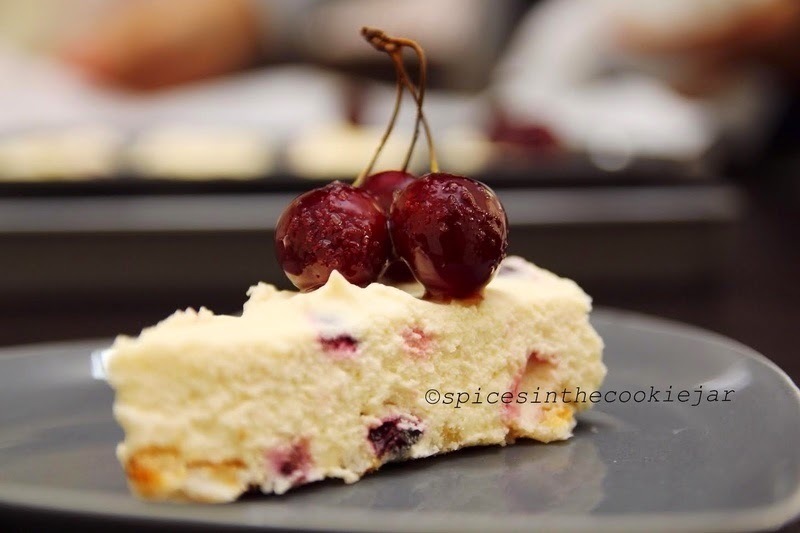 Fold in the whipped cream and candied cherries into this. Spoon the cheesecake filling into each muffin hole and smooth with a spatula. Chill for 2 hours or until set. 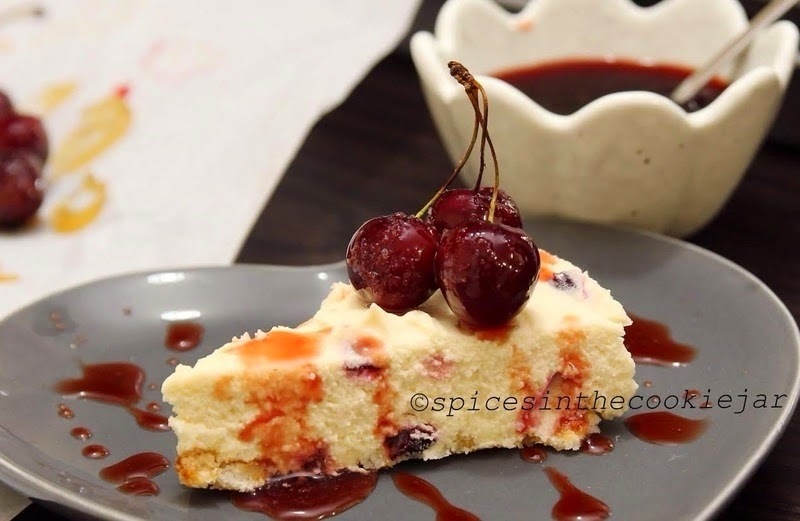 When you are ready to serve the cheesecake, dip the whole cherries in the sauce and place them on top. If you can't find coconut macaroons replace the base with digestive biscuits. Grind the biscuits along with butter in a food processor until crumbly and press it down in each muffin hole. If using a normal cake tin then line it with baking paper so it's easy to lift the cheesecake after chilling. Also run the sides with a knife after dipping in hot water to make this process easier. Please check out this link for additional help. Ramadan Mubarak to all! 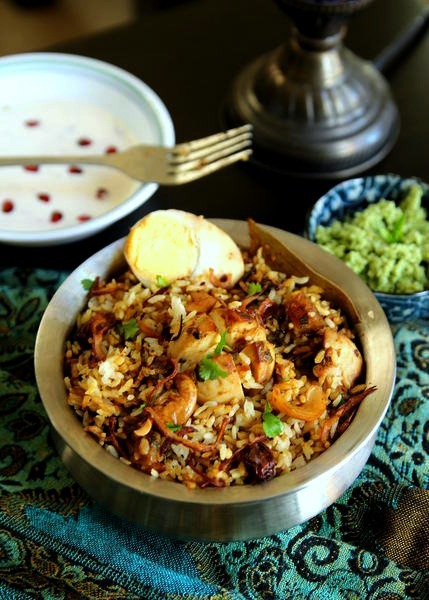 Time just seems to fly and here we are celebrating yet another Ramadan and I am doing another guest post for Lubna of Kitchen Flavours. 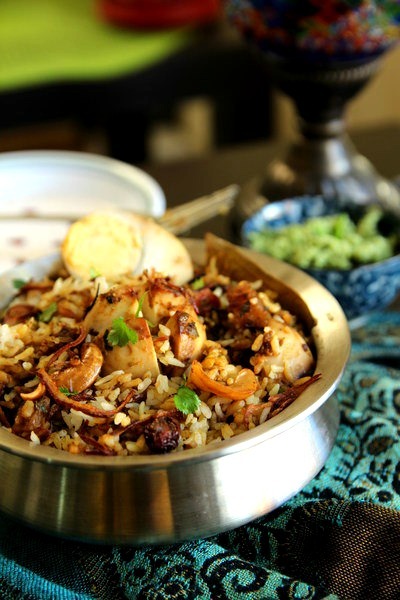 Every year she hosts this wonderful event - "Joy From Fasting To Feasting" which brings together bloggers from all over the globe to share their wonderful Ramadan Favorite Recipes. Thank you Lubna for letting me be a part of this event this year as well. Ramadan - a holy month for Muslims all over the world, a month of worship, a month of being closer to Allah. It presents the perfect opportunity to cleanse our mind and soul, to share with those in need, to rekindle and rebalance our lives away from materialistic things and lead us towards spiritual awakening. While the focus of Ramadan isn't necessarily food, it still ends up getting most of the attention. Well, it's definitely not a bad thing as it's also a time to be grateful for what you have and also share your bounties with those in need. Mix all the ingredients and pressure cook for 2 whistles. Let it stand till all the pressure escapes. Open the lid and check if the meat is cooked, if not cover and cook again. Once the meat is cooked, heat a pan and tip the beef in. Cook till all the water evaporates on high heat. Stir every few seconds so it doesn't get stuck to the bottom. In the meantime heat oil in another pan and fry coconut slices till golden. Tip all the other ingredients except garam masala and sauté till colour starts changing to brown. Add the garam masala and combine. Mix it into the beef and stir till everything comes together. Let it fry till the beef is dry on low flame. Boil the potatoes until they are cooked in a pressure cooker or microwave, let it cool. Peel the potatoes and crumble it using your hands or a masher. Heat oil in a frying pan on medium-high. When the oil is hot enough pop the mustard seeds. 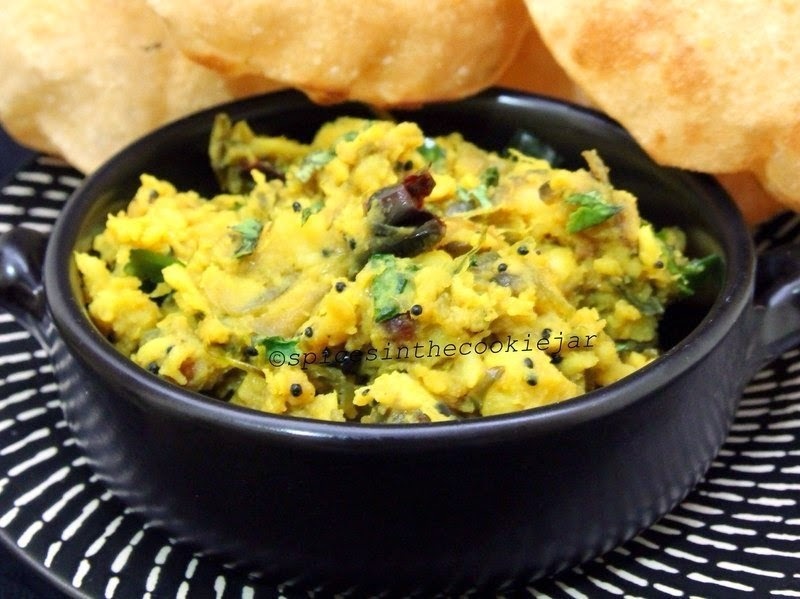 As the seeds crack turn the heat down to medium-low and ddd the chana dal. Fry till it starts to change colour. 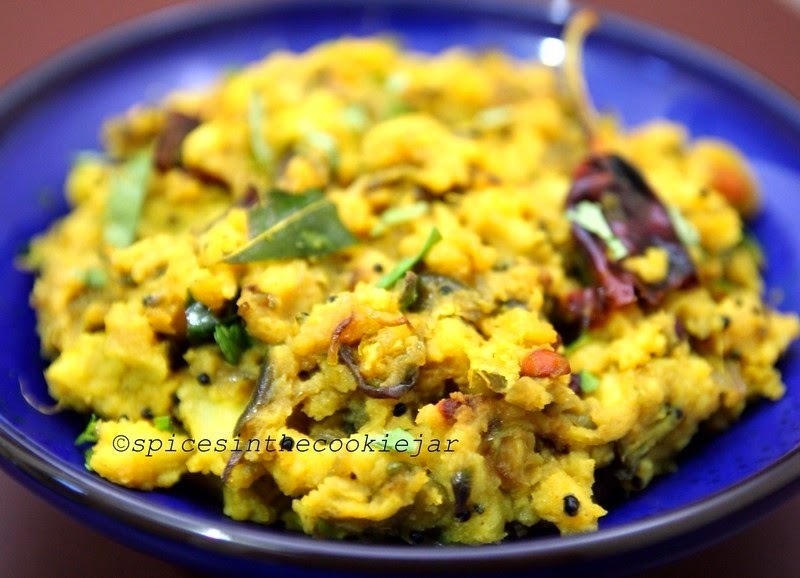 Immediately add the dry chilly, curry leaves, ginger and green chilly, toss for a few seconds. Add the onion and fry till it starts to caramelize. Mix the turmeric, garam masala, salt and sugar. Saute for a minute. Combine the potato with the masala and add the water. Mix until the masala is coated well on the potatoes. Cook till the potatoes are slightly moist and not very dry. Mix the coriander leaves and serve hot with Poori. Pooris are perhaps the most versatile and most liked among Indian breads. 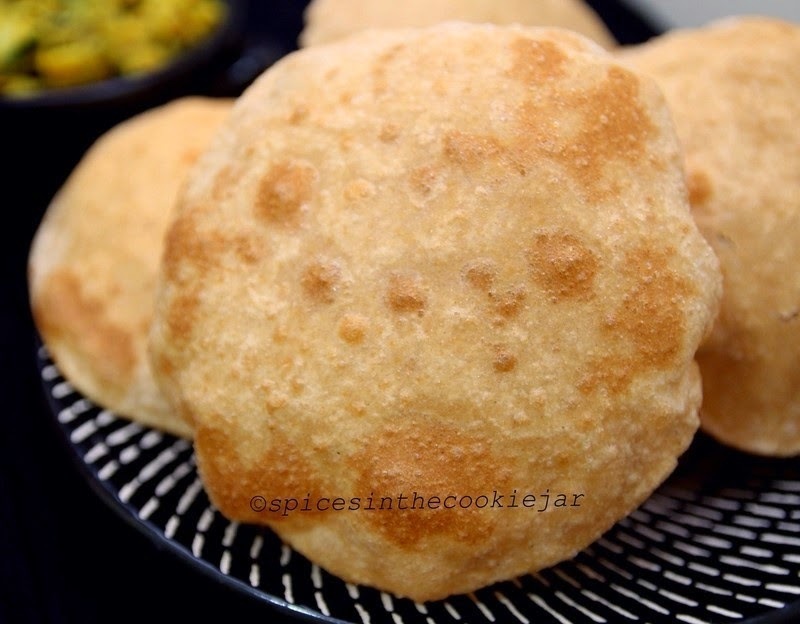 Making pooris is not a difficult process, and some tips and tricks will ensure you get perfect pooris every time. The dough, although similar to chapati dough, is thicker and less moist. Too much moisture in the dough and the pooris will absorb a lot more oil. The balls are rolled out into smaller circles and deep fried in oil until they puff up. They are best served hot with aloo/potato masala. Mix the flour and salt in a bowl. Add water little at a time and knead to form a slightly stiff, non-sticky, pliable dough. Make sure the dough is a bit more firmer and less moist than a chapati dough. Once the dough is formed, do not allow it to sit as it will soak more oil while frying. Form longish logs by rolling the dough between your palms. Pinch off equal ping-pong sized balls and roll them into smooth balls. Flatten the balls and roll out into circles smaller than chapatis (about 5 to 6 cm in diameter). Try not to use flour for dusting as this will leave a burnt residue in the oil. Use a little bit of oil instead while rolling out the pooris so it doesn't stick to the rolling surface. Roll out all the pooris, lay them flat without overlapping and cover them using a paper towel. Do not stack pooris as they will not puff up properly. Heat oil in a kadai, when the oil starts to shimmer carefully slide in one poori (work with one poori at a time). 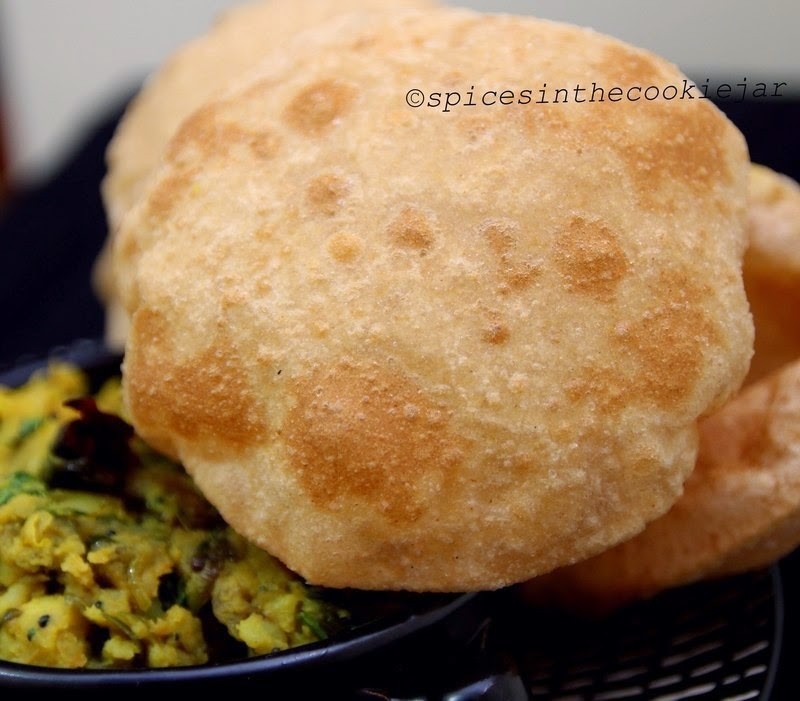 When the poori starts to float to the surface, gently push it down using a ladle so its covered in oil. 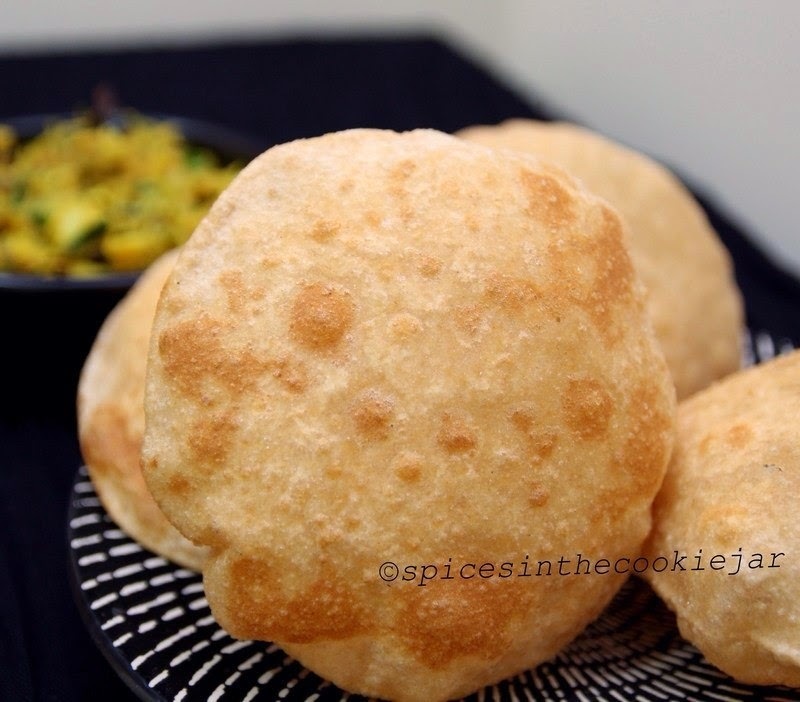 Once the poori puffs up, flip it over and fry till golden brown. 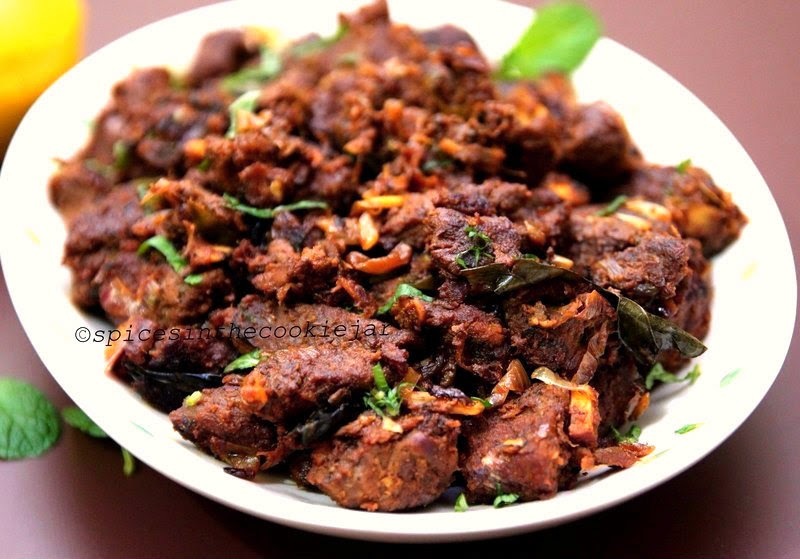 Remove and drain on paper towels and serve hot with potato masala. Do not stack rolled out pooris on top of each other. Avoid using flour for dusting but if you are using flour then use to a minimum. Check if the oil has reached the right temperature by dropping a small piece of dough, if it sizzles and floats to the top immediately the oil is ready. The oil temperature can go low once a few pooris are fried, so adjust the heat accordingly.